In March 2015, the U.S. Department of Energy announced the U.S. Wave Energy Prize, a public prize challenge which aims to achieve game-changing improvements in the efficiency of Wave Energy Technologies. An 18-month design-build-test competition, the Wave Energy Prize focused on catalyzing the development of game-changing wave energy converters that will ultimately reduce the cost of wave energy. 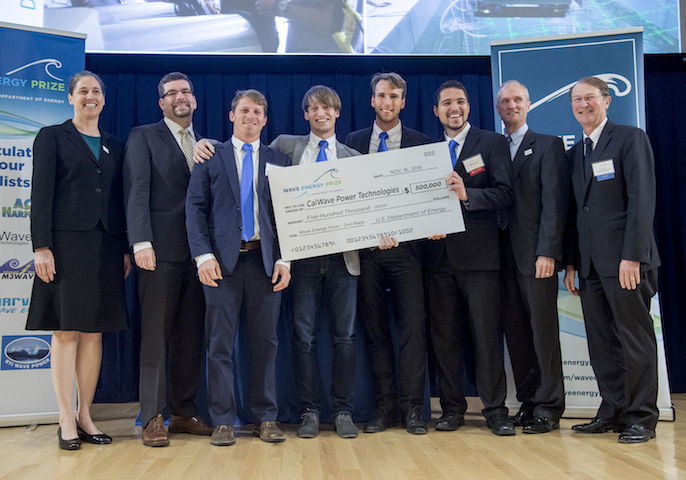 In November 2016, CalWave Power Technologies was awarded second with $500,000 cash prizes, following an 18-month long competition. Over the course of the competition, a panel of judges ultimately identified nine finalists and two alternates, which were announced in March 2016. These teams received up to $125,000 in seed funding to build scaled prototypes of their wave energy converter devices. With the support of the US Navy, the finalist teams tested their prototype devices at the Naval Surface Warfare Center’s Maneuvering and Seakeeping Basin at Carderock, Maryland. First and foremost, our team wants to thank leadership of DOE’s water program for initiating and organizing this prize and their ongoing support to the MHK industry. This Prize would have not been possible without the prize organization team, the judges, and the support and expertise from the national labs from designing the rules to the support of the data analysts supervising the last measurement in the tank. The 3rd party supervision of the tank testing made this prize a one of its kind and here we want to thank the team at the University of Iowa specifically Troy Lyons, Yugo Sanada, Frederick Stern and Hyunse Yoon, and the University of Maine specifically Anthony Viselli and the rest of his team. At the MASK test facility, we want to express our especial thank you to David Newborn and his team for the thorough preparation together months in advance and all their support through out the testing. It was a special honor for us to be invited to test in such a prestigious facility and we’re looking forward to using the collected data to improve our technology even further. We want to express our deepest gratitude to our collaborators, industry partners, and sponsors starting with Prof. Reza Alam, Joel Tchufag and the entire team at Taflab at UC Berkeley for their support, and also especially all our undergraduates and interns for the long hours in the machine shop. Additionally, we want to thank the Cyclotron Road team and the Lawrence Berkeley National Laboratory for their mentorship and all other mentors supporting us along the way. We want to thank the Bardex Corporation and here especially – Bruce Caldwell and Robert Taylor for all the constructive discussions and their support in designing and optimizing our full scale system. Thanks to Javier Ruiz and Jim Kring from JKI for their valuable support on our Labview integration. Cruz Atcheson Consulting, BMT Designers and Planners, Ansys, the RobotShop, Innosea, and Hirschfeld Fabrications for their contributions. We want to congratulate the other teams for entering the competition and contributing to the progress of the industry. The level of competition and surrounding expertise was very high and we are fortunate that we were able to meet so many talented technology developers in the course of the prize. Our team is excited about this milestone of the US wave energy industry and with the help of this prize, we are looking forward to continue this joint effort together with you on our path to a clean energy future where millions of US homes are powered by the endless energy of our ocean. Daniel Sadlier, Christian Windt, Devin Bisconner, Sean Luna, Kevin Cochrane, Jack Guo, Michael Kelley, Kabir Abiose, Andreas Hofer, Ryan Cosner, Nicolas Desmars, Nithin Jose, Soheil Esmaeilzadeh, Ennzhi Chew, Jackelyne Nguyen for all their support during our development, the unknown donor of NI module, Kafryn Lieder for her reviews and comments, Tom Avery, Diana and Arjun Divecha for their help. It’s wonderful, it’s wonderful…… Respect! That is a great accomplishment guys, congrats to you and everyone else who contributed, looking forward to hearing about your future achievements.